The protection and restoration of monuments in Slovakia today is governed by the Act of the National Council of the SR No 49/2002 on the Protection of Monuments Stock (as amended by the Act of the NC SR No 479/2005 Coll), approved on 19 December 2001, and put into effect from 1 April 2002. This Monuments Act has completely changed the philosophy of monuments protection in Slovakia. In the past the monuments preservation bodies were only advisory institutions for other state administration authorities. Although they often had broad-scoped competencies, in reality the existing legislation did not entrust them with decision-making power over the fate of monuments. That changed only with the Monuments Act of 2002. The new monuments organisation – the Monuments Board of the Slovak Republic – has directly become part of the specialised state administration and has assumed decision-making power in legal terms. The Monuments Board of the Slovak Republic was established on 1 April 2002. It is based in Bratislava, the capital of Slovakia. The protection of the monuments stock of Slovakia, in consistency with scientific knowledge and international conventions on the protection of cultural heritage, has become its main mission, provided for both in the Monuments Act and in the Statute. It has been entrusted with a society-wide role to carry out all activities related to the protection of the monuments stock of Slovakia. 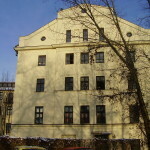 Organisationally, the Monuments Board is divided into the Central Office in Bratislava, concentrating on management, conceptual, methodological, scientific and research-related documentation and restoration works, and eight regional monuments preservation authorities, undertaking protection of monuments in the first instance of state administration in individual regions of Slovakia. The Monuments Board maintains the Central List of Monuments Stock of the Slovak Republic, containing registers of real and movable cultural monuments, monuments preserves and zones. It is the main groundwork for the performance of the state heritage administration. It is so because the powers of the Monuments Board and its regional branches come directly from these registers. Decisions can only be taken on the structures, objects and territories that are recorded as cultural monuments or historic districts or that are to be found in the protected territory. The protected territory may include monuments reserves, monuments zones or archaeological sites. Cultural monuments also include archaeological findings discovered through archaeological research. A thorough knowledge of the monuments stock is the main prerequisite for its good protection and rehabilitation. Therefore the principal task of recent years has been the revision of the Central List of Monuments Stock by means of basic field research and documentary research. The synthesis of data obtained, supplemented with the data of the preceding generations of preservationists, as well as the latest scientific studies, is the basis for the new edition of the publication National Cultural Monuments of the Slovak Republic, in which the entire monuments stock of Slovakia will gradually be introduced to the general public. In addition to providing synthetic knowledge of registered cultural monuments, the above revision will also result in proposals for the declaration of new cultural monuments or historic territories (the designation of structures as historic sites is in the competence of the Ministry of Culture of the Slovak Republic). Indeed, the historic treasures of Slovakia have not entirely been discovered yet and many structures, items or territories are still waiting to be revealed and evaluated. Where theoretical and methodological issues are concerned, the Monuments Board is guided and inspired by recent state-of-the-art trends in the protection and presentation of cultural heritage. The best have been selected from amongst all methods governing monuments preservation in the past centuries, and conservation, reconstruction and restoration are now being aptly combined. The aesthetic principle of rehabilitation has won over the historical one. Particular architectural periods and styles and their techniques are respected, none of them are negated at the expense of the other. At the same time, the preservation of the authenticity of the monument and its heritage values are highlighted (historic, social, landscape, urbanist, architectural, scientific, technical or artisanal). If restoration as a specific kind of recovering the state of a historic place is not necessary, artisan works and the use of traditional technologies and materials are pushed forward. Equally, in the presentation of a cultural monument, such a method would be applied that best preserves its heritage values, highlighting them, or optimally using them. What is important is the overall, self-contained reflection of the restored monument, although an analytical presentation of its exceptional elements is not ruled out. The improvement of the construction and technical conditions of the monument and the elimination of causes of decay and malfunctions are taken for granted in restoration efforts. Revitalisation of the surrounding environment also contributes to the resulting overall effect of the historic site restoration. Protection of monuments is not only a technically and financially challenging activity but also a very delicate matter as the preservationist directly interferes with the ownership rights of people and societies, who are the monuments’ proprietors or users. The interests of state protection of cultural heritage do not always consistently coincide with private interests. The monument preservationist-versus-owner relationship is not always ideal. During Slovakia’s recent economic boom, monument protection faced many tough struggles with the authorities. On the one hand the inflow of financial investments offer the hope of improved conditions for the monuments stock of Slovakia, while on the other they pose a risk that the commercial interests of influential companies, supported by public efforts to raise the standard living for the population, will steamroll the voice of monument preservationists. It is therefore important in this situation for the voice of heritage protection to be steadily raised and for new educational and promotional initiatives to be developed. Restrictive measures and sanctions, provided for in the Monuments Act for cases of contravention of the rules of monuments protection, do not alone nurture civil respect and affection for the nation’s cultural heritage. Thus the Monuments Board devotes considerable attention to its publications, exhibitions, lectures and other popularisation activities, by which it addresses the professional and the lay public alike, and with which it strives to cultivate citizens’ positive attitudes to the tangible and intangible riches of the Slovak country and the Slovak nation. The archaic and conservative Slovakia has still a lot to learn about how to be part of modern Europe, in which monuments are obvious and positive parts of the life of the individual and the society at large.